I recently sent an email to the Shrewsbury flower show about the removal of classes (i did mention this in my “Busy” blog). When i have sent letters to the show secretary in the past i have found replys that scirt around the subject, or i just havn’t had a reply. To be honest i didn’t expect a reply. I had an email from someone to say that the email was being passed to the marque manager. To my surprise i have received a very nice email from the marque manager. 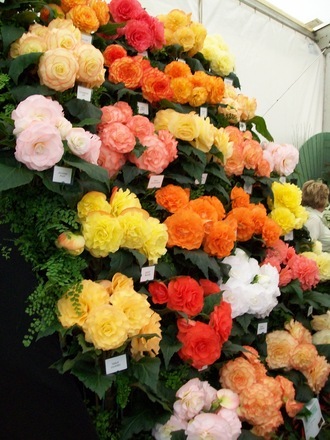 He has explained that class 6 and class 1 have been combined, so now there doesn’t have to be 3 distinct types of plant – there can be a display of just Begonias. The problem is that the stand is bigger, i would have to make sure i had enough plants, and enough help / someone to drive a van when we bring the plants back. Time is also a problem and cost of hiring a van (which is why i haven’t entered a stand last year). The email says he wants to talk with exhibitors, and says if i ask a steward on show day they will contact him and we can have a chat. Hopefully he can assure me that the class 1 isn’t also going to be withdrawn without warning, meaning a lot of work going to waste. If there aren’t assurances i will have to look out for an alternative show that i can display a stand at – not too far away. I look forward to putyting up a display stand again, whether it be at Shrewsbury or elsewhere. 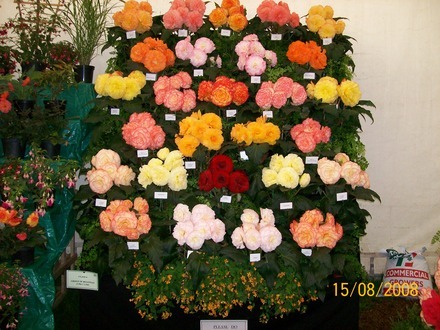 This is the class 1 stand in 2005, Stan always did class 1 (i used to help, that how i got interested in shows and Begonias). 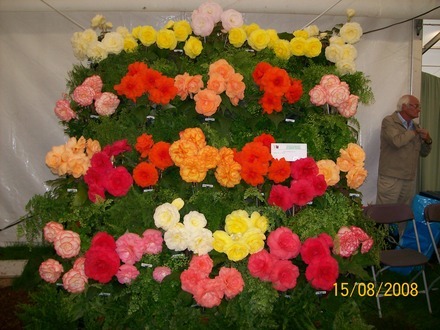 I didn’t enter the stand last year, but this is class6 by another exhibitor. Top quality. Class 6 is one of the classes removed! 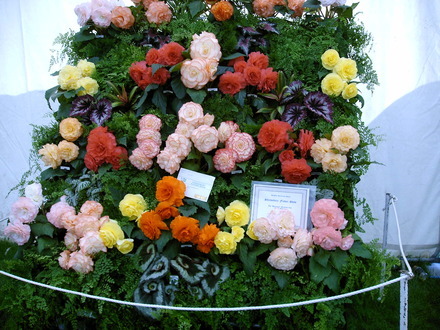 Next post: Shrinking Shrewsbury Flower Show! What a shame that the show committee have had to reduce the classes in something dear to your heart, but you have identified one problem that all shows face, people who could always be depended on to show, did not show. This can be for a number of reasons. We always tried to have our schedule out before people ordered supplies to grow for the show so that nobody was left having grown something and not being able to show it. People who used to show may not do so because they feel it is too much work, not over the growing period, although that is a huge commitment, but just getting their stuff there and staged and then after probably a very long week having to pack it all up and take it home again. Add to that the cost of diesel or overnight accomodation and the problems for the show committee mount up until they have to say we cannot cope with a, b or c anymore. In our own show we were so successful that we had to stop running it. We had over 350 exhibits at the last show and only three of us fully committed to running it. It became a full time job for the last six weeks before the show as we had over 250 things which had to be done to run the show.This included going door to door in the villages and in the rural area covered by the parish, to raise the money we needed to ensure we would not be financially embarrassed. Extra tables had to be brought from other centres as we did not have enough. The exhibitors expected a very professional running of the show which meant we had to ask them to tell us a week beforehand what they were entering so that we could have their safety labels ready. We gave the judges a light lunch so that we could keep a hold of them until I had logged and checked everything was in order. I can go on and on. Latterly the committee was me in my sixties and two elderly gardeners one 90+ and the other 78. People will not commit to helping on the day because they - for example, one chap offered to help as a judges steward, he was so insistant on telling me how we could do it better, on the day of the show, when I did not have time to listen to him. He left in a huff because I asked him nicely to write his suggestion down and we would consider it for next year. Another lady did not attend the show because as she told our chairman 'I would have been expected to do the teas.' Save me from Local Shows. My husband who was left picking up the slack says if I ever get involved again he is going for a six week cruise. LOL. We had lots of fun when there were plenty of helpers but as our group of pensioners died off and younger pensioners did not want to be seen as OAP's they were not replaced. I sometimes despair of communities. There is always plenty of desire for a better standard of behaviour from the young ones but I think the older ones need to take a good look at themselves and what kind of role model they are for the young. I am so glad the show has responded to you and is willing to meet with you and talk to you. That sounds very positive even if you do not get your classes reinstated at least you are being given an opportunity to give your view. Good luck and enjoy the day whatever the outcome. Hope the weather is good for you. I think anyone who can display their hard work is better than me. I just don't have the eye for detail like you and others do. I hope you get your classes re-instated for next year! glad you found the website. 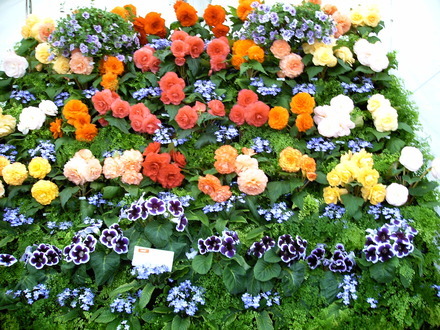 It is a good show, there is more there than the flowers - there is always the ring where they have horses, motorbikes, bands, it varies a little from year to year. Fireworks are always brilliant. It was because it is a big show that exhibitors feel let down, and the fact it was without prior warning - they should have printed their plans in last years schedule, or left those classes in this year to enable them to print the information in this years schedule. Even so, the amateur marque (the severn marque) will look dull without the stands in there, they brighten up the marque. Often the amateur marque is as good as the main marque, or was. I do also enter some smaller, local shows. I know that they don't have the same ability as the larger ones. Two that i used to enter have closed down now, unfortunately. I believe that the farmer that used to host the one show sold up, so there was no venue. The other declined for the reasons mentioned in the above comments, but i think the people that had always run that show were reluctant to give it over to someone else to run - but they just couldn't cope in the end and the show collapsed. One show was Hanwood & Cruckton, the other was always held in the grounds of Percy Throwers garden centre - there are pictures from them in my pictures (if you go back far enough). We had a very active OAPs club with an off shoot gardening group and another for Arts and Crafts classes. When we took the show on it was because it was cancelled without anybody being asked to help. There were thirteen of us in the gardening group and that was no problem but as members died off we realised we could not continue without assistance. We offered to hand it over to any interested group but none came forward until it had been cancelled then the hall committee came demanding the money in our account but we told them we could not hand that over under the constitution until they showed they were serious about running the show. We suspected they were not. I gave them all the paperwork on how we had run the show, stressing that they were free to do it their way and if they wanted our help the first year we would make ourselves available. I never heard from them again. Give it five years and maybe someone will want to take it on. Its not rocket science it is just very hard work. It is very rewarding too. It is a great way of drawing a community like ours together. Ours is a rural community with a grand estate, 3 villages and a farming community which is spread out and as the houses in the villages or farm cottages are sold or let to commuters, who come home to sleep, it gets harder to know all the people who live here. The show was somewhere they could all meet to share a common interest because the only thing they all had in common was a garden. Sounds very different from the group running the little show that i had entered. I now enter another show which takes place on the same week in September, A bit further to travel, but a slightly bigger show. With the Shrewsbury show i enter 4 shows in total. Shrewsbury, obviously, being the big one. I find the biggest obsticle is working around getting time off work for the shows. Having grown up in a village and took part in its village activities with my parents. I too tried to join a village flower/veg show where I lived with my young family about 20 years ago. But it was run by a committee of OAP's who did not want any new blood! They ran it, they judged it, and always the same few people won - year in year out. Is it any wonder the local newspaper stopped coming! and it did not survive. People who move in to villages may commute to earn their living but they also can make good contributions to the local economy, and to local events if allowed!!! Fair's Fair! The people collecting the cups and trophies do often seem to be the same people. I entered a different show a couple of years ago, and the people who won were on the committe of that show, the plants were not up to the quality of some that hadn't won - although it was the village i had grown up in (don't live there now, but it's not far away) I did vow never to enter that show again. I think i have won in the class at other shows, but never a cup - maybe i'm entering the wrong classes. Still not that bothered at winning cups, it's the entering that brings the enjoyment - and to win a class or two, if possible. Wish you had lived in our village Drc726, we would have lapped you up. We heard all those accusations about who was winning etc before we took over and decided we would do it differently.There was quite a kerfuffle when we announced that our outside validated RHS quality judges (not known to us personally and not allowed to come for more than three years, to stop the digs that they knew who was entering what, as they could see it every year) would be marking classes out of a maximum of 20 points. We even introduced RHS type safety labels which we pretyped with the class number and the name of the exhibits being sought. Only after the judge had chosen the 1st 2nd and 3rd place winners and given points out of a maximum of 20 and all the classes had been so judged were the safety labels opened out to reveal who the winners were. All other labels remained unopened. We introduced a rule that allowed exhibitors to grow their exhibits in either their own garden or in an allotment, and for the purposes of our show an allotment meant one garden which did not belong to the exhibitor and he/she was not paid to look after it. Some retired men were picking up lots of prizes by presenting items from half a dozen gardens which they were being paid to look after. Naturally we got complaints of unfair competition. The owners had to submit the entries from those 'kept gardens' under their own name but were free to give any prize money to their gardener. Points could not be allocated to the gardener however. We did have one chap who was a garden wizard and yes he won a lot of cups but he deserved them according to the judges. He retired from entering when we got a complaint from his wife that it was not fair that Craft classes and Baking etc. were only marked out of ten. The WRI judges in those classes traditionally marked out of ten. I was against changing it but the committee felt differently and the following year the top prize went to a woman who was a whizz at art and craft and great at baking and jam making. He was outraged and even more so when he found out it was his own wife who had complained. The lady was also very good at growing flowers and veg. The prize money was never an issue because we said that we were not offering prize money but might give prizes if we found we could afford to do so. When we stopped doing it we were giving out 26 cups, the winner of each got a (surprise) £5.00 voucher to spend in any garden centre taking them. Every exhibitor also got a prize because without them there would not have been a show. 5 tulip bulbs were our most popular prize because of the quality of them. My husband and I and our three children were incomers and one of the two men was also an incomer so maybe you have cracked our dilemma of was it 'us' or was it 'them' Our local paper was brilliant and always sent a photographer. They accepted an article each year from me which I wrote for submission the Tuesday following the local show. It usually ran to at least half a page and was always printed almost verbatim. I did occasionally make a spelling mistake. LOL All of our local businesses also supported us with raffle prizes. We had foam pillows as sold by Harrods at £50 each x 2 every year from the manufacturer who was on our patch, the local pub gave vouchers for 6 to have a meal in the pub. The local shop supplied all our needs in biscuits,tea sugar coffee milk etc. A past president of the RCHS who owns the local garden centre opened the show for us two years before it closed and he was amazed at what we were showing from local gardeners. He reckoned the show was maybe the best local show around. OAP's we might be, but dead we are not. Slower, yes and not as physically able, guilty as charged. The community were not let down by us, we needed help and asked for it but it was not forthcoming. The losers ? all of us, especially the children. It must be difficult with work as you say Mark. I wanted to work behind the scenes and help as I dont grow anything to exhibit Scotsgran, but it was such a closed shop. What are they scared of competition or change? You had some good ideas shame it couldnt work. It does not matter what your work or hobby is the best information is shared between its members at a level all can understand. I have no time for those who try to make out gardening is for the few and try to blind the rest of us with fancy phrases and latin etc. I did latin as part of my degree course but I did not use it with patients as I wanted them with me not resentful because I was showing off. Thats what I remember from these local shows! A certain titled lady always one the silver onion cup because she expected it and no one dared to annoy her! Her gardeners were never mentioned. One of our previous committees cancelled the show the night before and no amount of offers of help on the day would change the mind of the one person who had taken the decision. It was taken because someone who had been involved with the show died. A minutes silence would have pleased the grieving family more and we tried to explain that but to no avail. One exhibitor had taken a week off work to get her exhibits ready and packed for transporting, she was devastated. I can understand Marks problem of getting time to go to the shows. You would be surprised Drc726 at what is exhibited and the range in quality put on show at local shows. We encouraged everybody to have a go and learn from the experience. I was secretary of the very first show back in the 1980's. We had plenty of help because the decision to have a show was taken by the community council (the parish council equivalent in Scotland) and we were a lot younger in those days. Booking exhibits in to the show became a bit of a scrum as someone spotted something somebody else was showing and rushed off home to get their 'better' exhibit. We then had to retrieve their entry form and get the new item entered. We had fun and everybody worked hard to make it a success. Which it was. I agree sharing is much more fun than any alternatives and I'm sure if we put it to a vote we would find the Goyers 100% behind that, which is why this is such a great site. I think its a great site to.